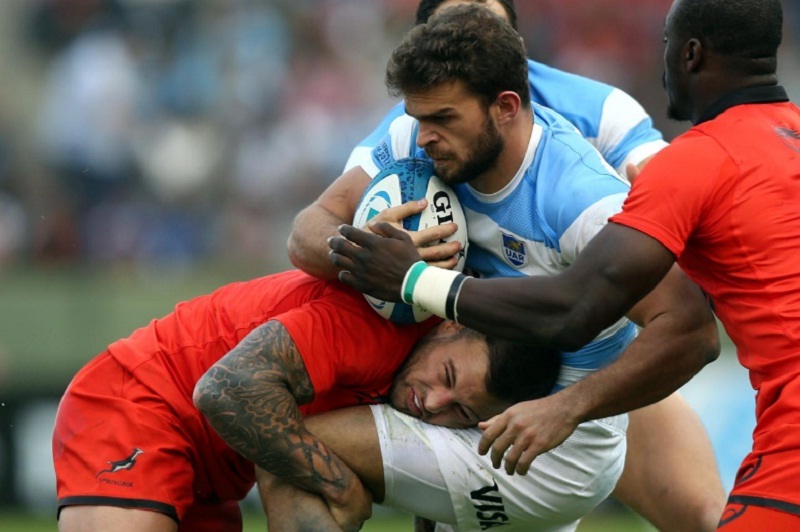 South Africa's Francois Hougaard tackles Argentina's Ramiro Moyano. CANBERRA - Argentina head back home for their final two matches of the Rugby Championship still seeking their first win and if they are to beat Australia or New Zealand they will have to do it without winger Ramiro Moyano. Moyano, who has played six of Argentina’s seven tests this year, will need an operation and at least six weeks on the sidelines after sustaining a fracture in his right hand during Saturday’s 45-20 loss to Australia at Canberra Stadium. While that will definitely rule Moyano out of the rest of the championship there is some hope for Matias Moroni, who also injured his right hand in the match and had it immobilised pending an examination back in Buenos Aires. Winger Moroni’s 78th minute chip-and-chase for a brilliant individual try was a rare highlight of the second half in Canberra for the Pumas, who gave up a lead for the second week in a row to lose their fourth match of the competition. “We had a good first half and a bad second,” said coach Daniel Hourcade. ”We failed to score tries and they did not miss anything. Australia ended up being a clearly dominant. When they scored against us, we lost our heads and that was the difference. They will also have to be better defensively than they were in the last 10 minutes in Canberra, when the Wallabies ran in three tries after replacement Pumas prop Enrique Pieretto had been yellow carded. “In the Rugby Championship there is no place or space for losing your concentration,” Hourcade added. ”They scored three tries in seven minutes and although they had an extra man, we missed tackles. Argentina head back home for their final two matches of the Rugby Championship still seeking their first win and if they are to beat Australia or New Zealand they will have to do it without winger Ramiro Moyano.